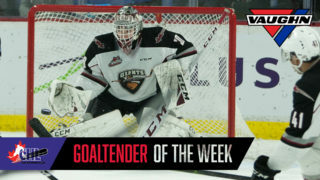 The Vancouver Giants would like to congratulate prospects Bowen Byram, Trent Miner (pictured), Harrison Blaisdell and Aidan Barfoot on being selected to represent their respective provinces at the 2016 Western Canada U16 Challenge Cup. Byram will play for Team Alberta, Miner will represent Team Manitoba, Blaisdell will suit up for Team Saskatchewan and Barfoot will play for Team BC. The tournament gets underway on October 19th in Calgary. Click here for the full team rosters. Byram, who hails from Lethbridge, Alberta, was drafted by the Giants at third overall in the 2016 WHL Bantam Draft. 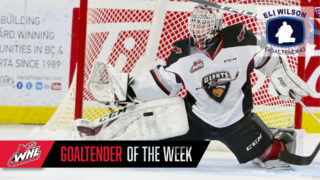 The 15-year-old rearguard scored 59 points in 34 games with the Lethbridge Golden Hawks Bantam AAA team last season. Vancouver signed Byram on June 17, 2016. Miner went to the Giants in the first round of the Bantam Draft at 20th overall. The Brandon, Manitoba native was inked by the G-Men on September 2, 2016. Miner posted a 1.52 goals against average in 27 games with the Brandon Wheat Kings Bantam AAA team last season. Blaisdell was a second round pick of the Giants at 31st overall. The Regina forward had 54 points in 25 games with the Yale Hockey Academy’s Bantam Prep team in 2015/16. This year, Blaisdell has one point in two games with the Regina Pat Canadians Midget AAA team. Barfoot netted 17 points in 25 games as a forward with the Delta Hockey Academy’s Bantam Prep team last season. 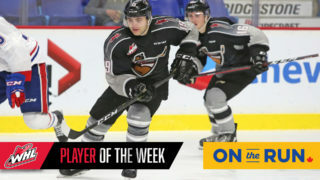 The Richmond native was drafted by the Giants in the sixth round at 113th overall and is playing this season with the Valley West Hawks of the BC Major Midget League. 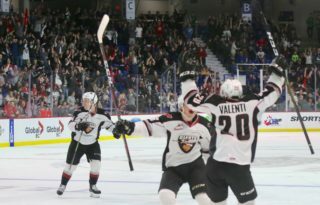 The Giants return to action on Wednesday when they host the Victoria Royals at the Langley Events Centre. Puck drop is set for 7:00pm. For tickets, click here or call 604.4.GIANTS (604.444.2687).